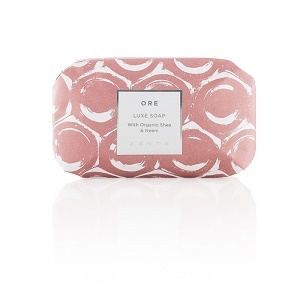 Thoughtful care and attention goes into each of these lovingly hand wrapped, triple-milled soaps. Unbelievably creamy, the luxurious shea butter suds replenish and pamper, imparting softness. Ayurvedic skin care ingredient neem bestows its natural antibacterial qualities to gently purify and balance, for fresh, immaculate skin. Feel your purity. These triple-milled shea butter bars hydrate and nourish as they cleanse. Luxuriously creamy shea butter suds replenish moisture, infusing the skin with softness. Drawing on the wisdom of Ayurvedic skin care, the formula imparts neem oil as a natural, gentle antibacterial that combats acne, eczema, dermatitis, and other skin concerns while deodorizing and balancing skin zones.